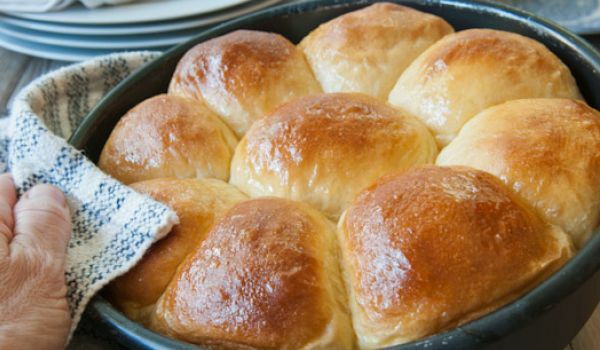 Sweet Potato Rolls are flavorful rolls from Philippines best to serve with soups and stews. Learn how to make/prepare Sweet Potato Rolls by following this easy recipe. Add yeast and stir to dissolve it. Add 1 tbsp of white sugar and mix well. Allow the mixture to stand for 5 minutes. Beat the eggs slightly in a small bowl. Add the remaining white sugar, sweet potato puree, margarine, salt and beaten eggs. Stir well to mix the ingredients. Add in 3 cups of flour and stir. Turn the mixture on a lightly floured surface. Knead the mixture for 2 to 3 minutes adding enough flour to prevent the dough from sticking. Knead to form smooth dough in the shape of a ball. Place the dough in an oiled bowl and turn around to coat all over. Cover the dough and let it rise for about 1 hour or longer, as required. Punch the dough again and let it rest for 2 minutes. Divide the dough into 16 to 20 balls. Grease a cookie sheet or 9x13 inch baking pan. Place the balls on the cookie sheet or baking pan. Bake the balls for 12 to 20 minutes.